PolyMedix was founded in 2002, based on proprietary computational drug design technology which was exclusively licensed from the University of Pennsylvania. This technology is based on the work of Drs. William DeGrado and Michael Klein, who are members of the National Academy of Sciences, the American Academy of Arts and Sciences, and the Royal Society. PYMX has several valuable products in pipeline: anticoagulant reversal agent (PMX-60056), PMX-30063, a broad spectrum antibiotic for oral and topical applications, PMX-10098, an anti-fungal compound; PMX-30016, a bio-defense product, PMX-2005, an angiogenesis inhibitor, PMX-10072, an anti-tuberculosis compound; and PMX-30024, an anti-malaria compound. PMX-50003 and PMX-70004 polymer biomaterials. Polymer derivatives of the antimicrobial drugs can be used as additives to materials to create self-sterilizing surfaces and bactericidal products – paints, plastics, and textiles. The problem of drug resistant bacteria is no longer confined to hospitals, and can be found in many places in the community. anticoagulant reversal agent PMX-60056 and PMX-30063, a broad spectrum antibiotic. Disclosure: with current price ($0.94) PYMX could be an incredible target for long-term investment (2-3 years). The broad pipeline spectrum also suggests some possibility for company acquisition in nearest future. I don't have a position in PYMX now. I was waiting for this opportunity long time. Today news allowed me to buy cheap PYMX (30k at $0.68). "PolyMedix, Inc. (OTC BB:PYMX.ob - News), an emerging biotechnology company focused on developing new therapeutic drugs to treat infectious diseases and patients with acute cardiovascular disorders, announced today the pricing of an underwritten offering of 25 million units, each unit consisting of one share of its common stock and a warrant to purchase one-half of a share of its common stock at an offering price of $0.80 per unit. PolyMedix expects to receive net proceeds, after deducting the underwriting discount and estimated offering expenses, of approximately $18.6 million. The warrants will have a five-year term and an exercise price equal to $0.80 per share. In addition, PolyMedix has granted the underwriters a 30-day option to purchase up to an additional 3.75 million units at the offering price. The offering is expected to close on April 11, 2011, subject to customary closing conditions. Cowen and Company, LLC is serving as sole book-running manager for the offering. Rodman & Renshaw, LLC, a subsidiary of Rodman & Renshaw Capital Group, Inc., Roth Capital Partners, LLC, and Noble Financial Capital Markets are serving as co-managers." Well, may it's last opportunity to buy PYMX under $1. "These data continue to support the novel mechanism of action and selectivity of our defensin-mimetic compounds against bacteria, fungal pathogens and parasites," commented Dr. Richard Scott, Vice President of Research at PolyMedix. "We are excited about the new opportunities for potential use in Candida fungal infections and malaria, presented by these latest findings. We are grateful for the high degree of attention our research receives from the scientific community, which we believe reflects the importance of the work. We look forward to further advancing these programs and expanding their scope of uses." In a poster titled, "Activity of an Antifungal Peptide Mimetic in an Experimental In Vivo Model of Oral Candidiasis," Dr. Scott presented data describing the anti-fungal activity of PolyMedix's defensin-mimetic compounds. This presentation described a series of compounds that are potently active and highly selective for the Candida fungal pathogen over other bacterial and eukaryotic cell types. The compounds appear to kill C. albicans by rapidly permeabilizing its cell membrane, similar to the mechanism of action of other defensin-mimetic compounds in killing bacteria. The activity of a lead compound, PMX-519 was examined in an oral model of Candida infection in mice. Mice were treated with a single topical application of drug three days after infection of the oral cavity with C. albicans. The results showed that PMX-519 produced near total sterilization of the infected tongue following the single administration, and was 50-fold more effective than nystatin, a commonly used anti-fungal agent. This work was supported under a Phase 2 SBIR grant received from the National Institute of Health (NIH). PolyMedix's antimicrobial compounds show promising activity in experimental models of malaria. The data presented showed that PolyMedix's antimicrobial compounds potently killed the parasite that causes malaria, Plasmodium falciparum, in infected human red blood cells, without damaging uninfected red blood cells. The compounds appear to rapidly target the membrane of the digestive vacuole of the parasite via a unique mechanism which is distinct from other anti-malarial agents. Encouraging in vivo activity was also reported with a potential lead compound on malaria parasite clearance and animal survival in a mouse malaria model. This work was supported under a Fast Track SBIR grant received from the National Institute of Health (NIH)." If I consult big pharma about small biotech asquisition I will say: buy PYMX now for any premium like 100-200%. 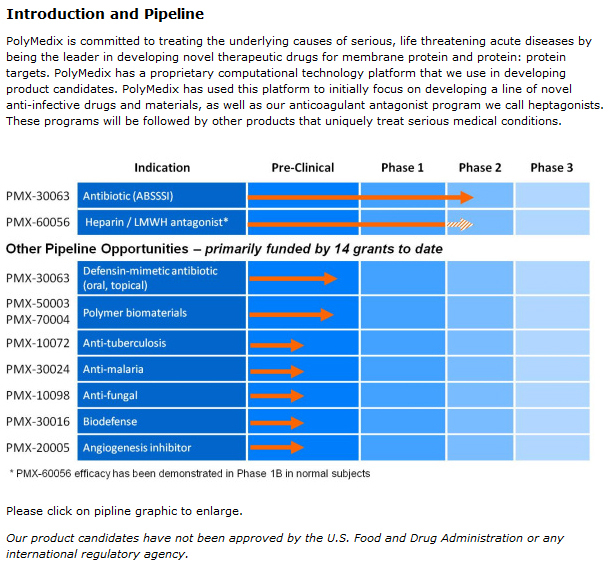 After 215 patients phase II trial results release for PMX-30063 defensin-mimetic antibiotic in treating patients with Acute Bacterial Skin and Skin Structure Infections (ABSSSI) caused by Staphylococcus aureus (expects to report data from the full study in the first half of 2012) they will pay for PYMX much more than $200-300M. Disclosure: I have PYMX positions (long, will sell PYMX only when pps >$5). Britain is facing a "massive" rise in antibiotic-resistant blood poisoning caused by the bacterium E.coli – bringing closer the spectre of diseases that are impossible to treat. Professor Peter Hawkey, a clinical microbiologist and chair of the Government's antibiotic-resistance working group, said that antibiotic resistance had become medicine's equivalent of climate change. The "slow but insidious growth" of resistant organisms was threatening to turn common infections into untreatable diseases, he said. Already, an estimated 25,000 people die each year in the European Union from antibiotic-resistant bacterial infections. "It is a worldwide issue – there are no boundaries," he said. "We have very good policies on the use of antibiotics in man and in animals in the UK. But we are not alone. We have to think globally." Between 2005 and 2009 the incidence of E.coli "bacteraemias" [the presence of bacteria in the blood] rose by 30 per cent, from 18,000 to over 25,000 cases. Those resistant to antibiotics have risen from 1 per cent at the beginning of the century to 10 per cent. "Only one in 20 of infections with [resistant] E.coli is a bacteraemia, so the above data are only the tip of an iceberg of infected individuals," says a report produced by Professor Hawkey's group, commissioned by the Department of Health and the Department for Environment, Food and Rural Affairs. Dame Sally Davies, the Government's chief medical officer, has pledged £500,000 to fund research into the threat. Drug companies have lost interest in developing new antibiotics because it is increasingly difficult to find new agents and it is not commercially viable – antibiotics are taken for a few days, compared with, say, a heart drug which may be taken for life. "There are only so many antibiotics available and as we lose them it becomes more and more difficult to replace them," Professor Hawkey said. The rapid rise in E.coli blood poisoning is thought to be linked with the ageing of the population. E.coli is a common cause of urinary-tract infections but may also cause wound infections following surgery or injury. These are regarded as minor conditions, but if they became untreatable they would be life-threatening. E.coli infections pose a much bigger problem than MRSA because the bacterium is more common. Only one in 10 people is a carrier of MRSA, but E.coli is present in everyone. "Those who get ill [with E.coli] are rare – but because it is so common it is a big problem," Professor Hawkey said. Using standard antibiotic regimens, there is a one in 10 chance that treatment of an E.coli infection will fail because the bug is resistant. But, as numbers of resistant infections rise, there will be increasing pressure to use more powerful antibiotics, called carbapenems, which are the last line available. And resistance to those is already emerging. "In the last two or three years we have seen [organisms] develop which destroy carbapenems. That is a great worry," Professor Hawkey said. The warnings follow increasing reports from Europe of patients with infections that are almost impossible to treat. In November, the European Centre for Disease Control and Prevention (ECDC) said up to 50 per cent of cases of blood poisoning with the bacterium K.pneumoniae, a common cause of urinary and respiratory conditions, are resistant to carbapenems in some countries. Across Europe, the percentage of carbapenem-resistant K.pneumoniae has doubled from 7 per cent to 15 per cent, the ECDC said. Marc Sprenger, the director, said: "The situation is critical. We need to declare a war against these bacteria." Meanwhile, the UK Health Protection Agency warned doctors in October to abandon a drug usually used to treat a common sexually transmitted disease because it was no longer effective. The agency said that gonorrhoea – which caused 17,000 infections in 2009 – should be treated with two drugs instead of one. Bugs are like all other life forms: they must adapt to survive. Unlike human beings, however, for whom evolution is measured in millennia, reproduction is so rapid among bacteria that they can change in months or years. With the introduction of a new antibiotic, natural selection goes to work. Most bacteria are killed by the new drug but the natural variation that occurs in any species means a few examples may, by chance, have some quirk in their genetic structure that allows them to survive. These bacteria are then selected out by the antibiotic, which kills the rest. The mutant bacteria grow in numbers until they become the dominant species. PolyMedix, Inc. (OTCBB:PYMX.OB - News), a biotechnology company focused on developing innovative therapeutic drugs to treat patients with serious acute-care conditions, has scheduled a conference call and webcast for Monday, April 23rd at 9:00 AM Eastern Time. At that time, management will review the full results from the Phase 2 clinical trial with PMX-30063 defensin-mimetic antibiotic for the treatment of Acute Bacterial Skin and Skin Structure Infections (ABSSSI) caused by Staph aureus. But the real life is uglier than fairy tales. Most likely that PYMX will sell stocks to make money (as usually for good reasons like new clinical trials and etc.) and longs will have nothing. Funds will buy all shares at low and then initiate a buyout at $7-8. End of story. So, I will not keep PYMX if news are good, just will sell it at high.